Among the nation’s more than 17 million Hispanic children, 35% lived in poverty in 2010. However, poverty rates vary widely among different groups of Hispanic children. For example, those in families headed by a single mother have the highest poverty rates, 57.3%, while those in families where at least one parent has a college degree have the lowest (8.7%). The economic situation of parents plays an important role in affecting the poverty status of children. 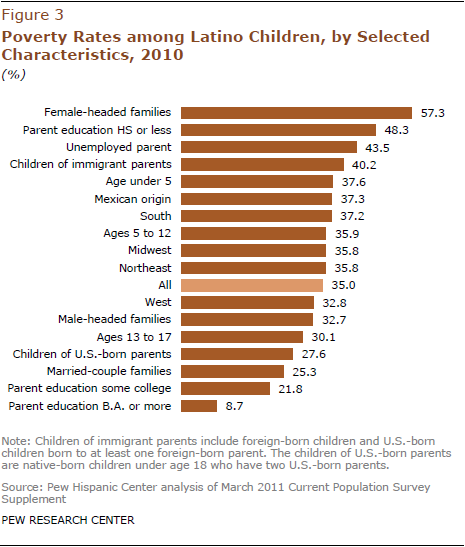 Among Latino children with an unemployed parent, 43.5% lived in poverty in 2010. Among Latino children in married-couple families, the 2010 poverty rate was 25.3%, less than half the size of the poverty rate among children in female-headed families (57.3%). Among Latino children in male-headed families, 32.7% lived in poverty. Hispanic children in families with a college-educated parent have the lowest poverty rates overall—8.7% in 2010. Among Hispanic children in families with a parent who has some college experience, 21.8% lived in poverty. By contrast, nearly half (48.3%) of Hispanic children with parents that have a high school degree or less lived in poverty in 2010. The nativity of parents is an important factor in explaining poverty rates among Latino children. In 2010, the poverty rate among Latino children with immigrant parents was 40.2%, while it was 27.6% among Latino children with U.S.-born parents. Childhood poverty rates are also linked to the age of the child. Among Latino children younger than age 5, 37.6% lived in poverty in 2010. Among those between the ages of 5 and 12, 35.9% lived in poverty, while among those ages 13 to 17, 30.1% lived in poverty. The impact of the Great Recession on Latino children has been varied. Since 2007, poverty rates increased most among Latino children with parents who have a high school education or less—up 9.7 percentage points. That is followed by Latino children who are the children of immigrant parents—up 9.5 percentage points between 2007 and 2010. By contrast, between 2007 and 2010 poverty rates increased the least among Latino children with parents who have a college degree (up 0.6 percentage points), Latino children who live in the northeast (up 2.1 percentage points) and children of U.S.-born parents (up 2.3 percentage points). Among all Latino children, the poverty rate increased 6.4 percentage points between 2007 and 2010.